As most of you know since becoming pregnant I have become addicted to citrus and I just can’t get enough. Lately, I’ve been wanting orange juice all the time, which is crazy for me because I hardly ever drink juice unless it’s a strong freshly squeezed green juice. Well I have been indulging my juice craving lately by allowing myself to buy a bottle every other week. 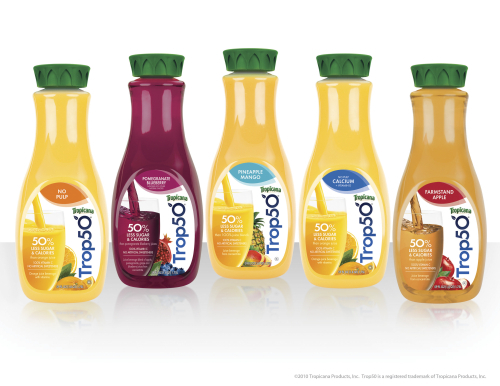 Since I am trying to be careful with my sugar intake I decided to use the coupon for a free bottle that Tropicana sent to me and I finally tried Trop50 Orange Juice which has 1/2 the sugar and calories of other orange juices. Currently I am really enjoying being able to indulge my craving without overdoing the sugar. One of the other cravings I plan on indulging in the upcoming month is a prenatal massage, a much needed massage. The best part is Trop50 is offering one of you a chance to win a $50 Spa & Wellness Gift Cards by Spa Week® to get the spa treatment of your choice. You can also enter for a chance to win a $1000 gift card when you share your New Year’s Resolution on Trop50’s Facebook page! To enter this giveaway, all you have to do is leave a comment telling me what your favorite treatment is to get at the spa! This giveaway will be open until Tuesday, January 31 @ 8pm EST. A winner will be announced Tuesday.